Opened for play in 1998, this Roger Packard/Andy North designed course has been awarded 4 stars (out of 5) in Golf Digest Best Places to Play. 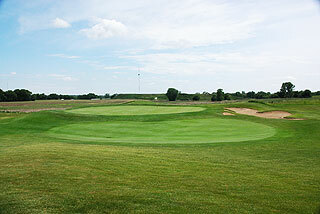 Prairie Bluff in Crest Hill, is located less than 30 miles south of downtown Chicago. Supervisor of Golf Course Maintenance, Luke Strojny, deserves mention for the course being primarily known for its immaculate condition. There are all-natural lakes and ponds, and untouched natural prairie grass with an abundance of beautiful wildlife that call this environment home. The yardage is well marked on the fairways with all sprinkler heads marked measuring to the center of the greens. Cart paths are marked from 100, 150 and 200 yards as well. Red, white and blue colored flags determine front, middle and back hole locations. 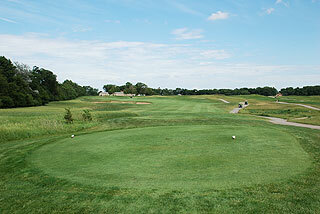 This links style course is wide open, nearly bare of trees, and wind often prominently in play. Tees and greens are elevated throughout most of the layout, with plenty of mounding in between. 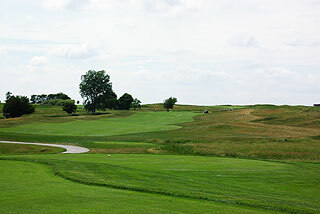 It is crucial for golfers to hit the wide, fast and rolling fairways as the prairie grass rough nearby presents difficult recovery situations. 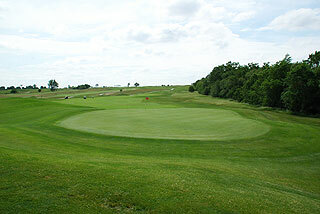 The large, fast paced putting surfaces are undulating and sloping with perimeter mounding. Four sets of tees play to distances and slopes measuring 6893 yards/124 slope, 6466 yards/120 slope, 6054 yards/116 slope for men, and 121 for women, and 5326 yards with a slope of 113 for women hitting from the forward tees. 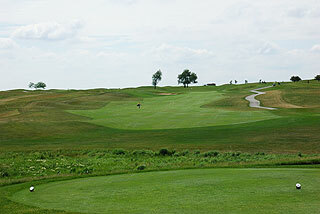 In total there are 32 soft sand bunkers situated greenside and near landing zones, and water comes into play on 8 holes . 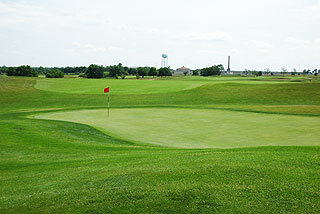 Most of the sand traps are located on the front nine. 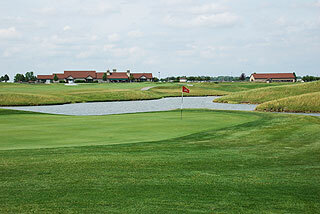 The clubhouse features a well stocked pro shop, a restaurant serving breakfast, lunch and dinner, and a banquet center serving up to 250 people. Also on property is a practice facility with golf lessons available. 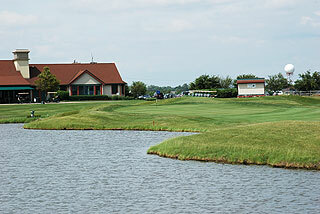 The facility includes a targeted grass driving range, a large practice putting green and a short game area with a sand bunker.